This is my map of the area in Southern Israel where the cities of Sodom, Admah, Gomorrah and Zeboiim were likely to have been situated. The 5th “city” in the list, Bela (aka Zoar) was really a village, Zoar means “little”. 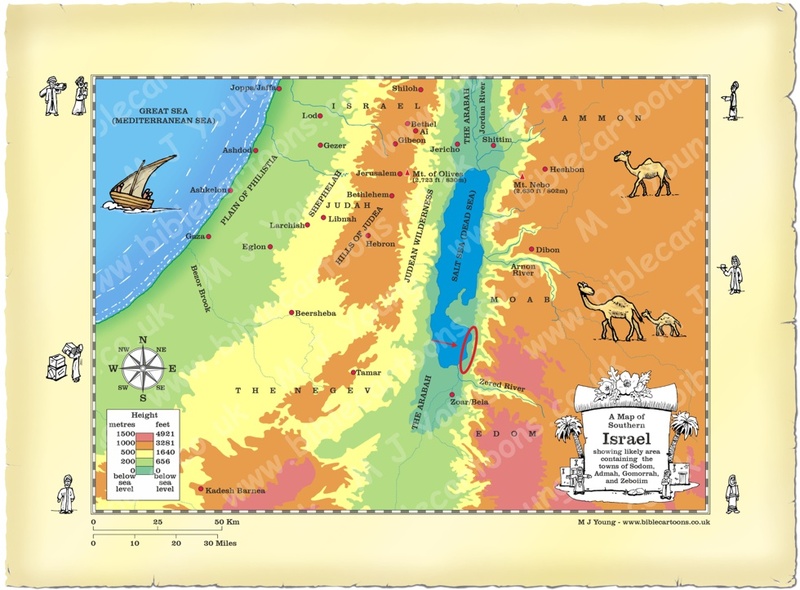 There has been some doubt about the exact location of these 4 “lost cities”; many bible commentators placed them North of the Dead Sea, but archaeological excavation  evidence tends to support their position South East of the Dead Sea. My map illustrates that location with a red oval and arrow. Like Sodom, the ruler of Gomorrah was vanquished by a Mesopotamian confederacy that invaded the Jordan Valley whilst Abraham lived near by (Genesis 14:8-11). Genesis 19:24-25 informs us that the Lord destroyed the first 4 cities with fire and burning sulphur, because of the wicked evil the people opf those cities did in the Lord’s sight (Genesis 18:20-21). The wickedness of these cities became proverbial in later books of the Bible, for example Isaiah 3:9 & Jeremiah 23:14 both refer to the wicked ness of Sodom and Gomorrah. Jesus referred to the destruction of Sodom and Gomorrah when talking about the Day of Judgement upon villages in Israel that wouldn’t entertain the apostle’s message of salvation in his day (Matthew 10:15). I read an article written by an archaeologist (Bryant G. Wood) who believes that the lost cities of Sodom, Gomorrah, et al are located on the eastern shore of the Dead Sea. His excavations have uncovered evidence of extensive burning of the area, which certainly could be the “fire and burning sulfur” mentioned in the Bible. Some time around 1900 B.C. 8 But now the army of the kings of Sodom, Gomorrah, Admah, Zeboiim, and Bela (now called Zoar) prepared for battle in the valley of the Dead Sea  9 against King Kedorlaomer of Elam and the kings of Goiim, Babylonia, and Ellasar—four kings against five. 10 As it happened, the valley was filled with tar pits. And as the army of the kings of Sodom and Gomorrah fled, some slipped into the tar pits, while the rest escaped into the mountains. 11 The victorious invaders then plundered Sodom and Gomorrah and began their long journey home, taking all the wealth and food with them. Hebrew, in Siddim Valley, see 14:3. 24 Then the LORD rained down fire and burning sulfur from the heavens on Sodom and Gomorrah. 25 He utterly destroyed them, along with the other cities and villages of the plain, eliminating all life—people, plants, and animals alike. 9 The very look on their faces gives them away and displays their guilt. They sin openly like the people of Sodom. They are not one bit ashamed. How terrible it will be for them! They have brought about their own destruction. 14 If a village doesn’t welcome you or listen to you, shake off the dust of that place from your feet as you leave. 15 I assure you, the wicked cities of Sodom and Gomorrah will be better off on the judgment day than that place will be.